Edward brings four years of Drupal and full-stack experience to his role as a Developer at Mediacurrent. He has experience in all tiers in the Drupal stack- from front-end theming, to custom module development, to performance/scalability and migrations. 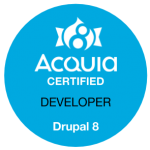 One of his main interests right now is to dive deeper into Drupal 8 and headless Drupal architecture using modern frameworks and libraries. Edward is also an active attendee at regional Drupal camps, DrupalCon, and other technical meetups. Edward started his Drupal career at The Gilder Lehrman Institute of American History, where he was first exposed to Drupal. During his time there, he was part of a 2-person tech team that helped enhance and scale the website which generated 100% increase in traffic year over year. He then joined NorthPoint Digital as a consultant and implemented Drupal solutions based on client needs. During his tenure there, he gained immense experience with custom module development in an agile environment, and even had the chance to contribute his first patch to a contrib module (Social Media Aggregator)! He also further developed his skills by diving into some modern technologies such as React and Node.js to work with Drupal data. Born and raised in New York City, Edward is accustomed to the fast-paced lifestyle and enjoys roaming around NYC searching for the next best cup of coffee, finding the next restaurant serving exotic foods, as well as attending Knicks games.